ST. FINGHIN'S CHURCH was built between 1278 and 1285. This long, rectangular ruin is on the far side of the River Rine from Quin Abbey. Its main features are the remains of a richly moulded window in the south wall and a thirteen-foot-wide opening in the east-gable window. A square tower about fifty-six feet in height was later built at the south-eastern angle with the door opening into the church. 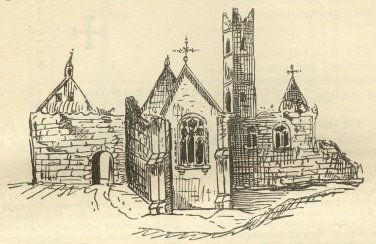 According to tradition, the church was dedicated to St. Finghin, but by 1839, John O'Donovan was unable to discover which St. Finghin it commemorated or even which holy day had been kept in his honour. No part of the church appeared older than the fifteenth century to him. QUIN CASTLE was built in 1280 by Thomas de Clare in an attempt to subdue the MacNamaras. This was a massive Norman castle with large rounded towers at each corner. This strong-walled keep was reduced to a hideous blackened ruin six years later when Cuvea MacNamara avenged the death of an O'Liddy chieftain who had been killed by the Norman garrison. He attacked, ransacked and burned the castle, slaying most of the defenders. Parts of the castle towers still remain at the south-east, south-west and north-east corners of the abbey. Part of the vanished north-west tower, or at least its site, can still be discovered. Much of the remaining castle walls were incorporated into the abbey's south and east walls. A fragment to the north-east, close to the tower base, shows how sturdily built the thirteenth-century castle had been. From the fourteenth century onward the MacNamaras were the most powerful family in the baronies of Upper and Lower Bunratty and Upper and Lower Tulla. By 1578 they owned forty two castles scattered over the entire area of those baronies. QUIN ABBEY was founded by the MacNamaras around 1350. Using the solid south curtain-wall of the old castle, they built a church from east to west. North of the church they erected a residence for the clergy and a small sacristy. Sioda Cam MacNamara built the cloisters in 1402. The bell-tower and Lady Chapel were erected by Mahon MacNamara in 1430. Three years later he sponsored the Franciscan friars and allowed them to establish their friary in Quin. The abbey was officially suppressed in 1541 and became O'Brien property in 1547. The O'Briens, however, allowed the friars to continue living there. By 1548 it had fallen into disrepair and was described as "one great church, now ruinous, covered with slate, and a steeple greatly decayed". In 1584 Sir John Perrot had Donough Beg O'Brien half-hanged from a cart, his bones broken with the back of an axe, and hung, still alive, on the steeple of Quin Abbey. The English forces maintained a barracks in the abbey until a namesake of Donough's burned it over their heads. The MacNamaras, with some help from other families in the district, repaired the church. The walls had suffered very little damage due to their firmness. By 1604 the choir and Lady Chapel had been roofed over and the ground-floor apartments made habitable. In 1617 the Irish Franciscan Provincial, Fr Donough Mooney, noted the repairs and commented on the two or three friars then in possession as being "old, helpless men with scarcely a memory of the pre-suppression friary". They told him that the altar plate of gold and silver had been given to one of the MacNamaras of Knappogue for safekeeping. Unfortunately, MacNamara died before he could divulge the whereabouts of the abbey's altar plate. The Cromwellians broke into the friary and desecrated it in 1651. They shot and beheaded Fr. Rory MacNamara and hanged Fr. Donald Mac Clancy and Br. Dermot MacInerney. By 1667 the Franciscans had returned. Fr. Moriarty O'Griffin was named as the guardian in 1670. A few years later, in 1681, the abbey was reported empty, but the friars had returned again by 1691 when the cavalry of the defeated Irish army camped around the walls. The friars were expelled again by Colonels William and Henry Stamer some time before 1760 but remained in the townland of Drim, a few miles away. One friar, however, continued to live in the abbey ruins. Other friars succeeded him. The last friar of Quin was Fr. John Hogan of Drim. He died in 1820. His tombstone lies at the north-east corner of the cloister walk. Sixty years after his death the Board of Public Works took over the abbey as a national monument. THE LADY CHAPEL is the last resting place of John "Fireball" MacNamara. He was the last of the MacNamara chieftains, a direct descendant of the men who built this abbey. They too were buried here. The best preserved of the MacNamara tombs is the one north-east of the choir. The Latin inscription along the edge of the covering slab beneath the carved stone canopy may be translated as follows: "Here lie Hugh, who was the son of Laurence, who was the son of Matthew MacNamara, and Couleen MacNamara his wife, who caused me to be made". This tomb was built around 1450. Inserted under the canopy is another slab which states that Captain Teigue MacNamara repaired the tomb in 1714. THE TOWER can be reached by following the gulley walk that leads from the west wall of the dormitory. The view from the top of the tower is most impressive and well worth the climb up the narrow spiral staircase. The cloister is one of the abbey's finest features. The most unusual feature is the lavabo, or medieval toilet. It is located in a tower to the north of the main complex. This, in turn, is linked to the old dormitory by a connecting passage over an archway which joins the two structures. There is an opening in the lower part of the tower from which material for compost may have been taken in olden times. DAINGEAN UI BHIGIN CASTLE should not be confused with the nearby tower house of Dangan Breac. It is situated in the grounds of Dangan House three miles east-north-east of the village. This may be a mid-fourteenth century tower house as it contains few of the space saving innovations found in fifteenth-century buildings. Both keep and banquet hall were built in fine limestone blocks, split rather than dressed, but very little cut stone is visible. On December 20th, 1542, Sioda MacNamara surrendered his castles and lands in the baronies of Dangan, Bunratty and Tulla to Henry VIII in order to have them regranted to him and his heirs under English civil law. John MacNamara owned this castle and Dangan Breac castle in 1584 according to the Trinity College list. The castle was demolished in the closing days of the Cromwellian wars. The MacNamaras lost some of their holdings to two transplanted Catholic families, the Creaghs and the Whites. KNAPPOGUE CASTLE derives its name from "Caislean na Cnapoige", the castle of the place abounding in little hills. The castle was built by Sean Mac Con, the son of Sioda MacNamara, in 1467. This was the man who built the great transept of Quin Abbey and completed the construction of Bunratty Castle which his father Sioda had started. The Four Masters referred to him as "the chief protector of the men of Ireland and renowned for his hospitality". Knappogue became a Cromwellian garrison during that era as the MacNamaras had supported the royalist cause. Arthur Smith was granted tenancy of Knappogue by the Cromwellians and occupied the building from 1659 to 1661. After the restoration of the English monarchy, the MacNamaras regained it. Francis MacNamara sold it to the Scott family in 1800. They spent a considerable amount of money renovating it. Theobold Fitzwalter Butler, 14th Baron Dunboyne, bought it in 1855 and turned it into the new family seat of the Dunboyne family. They continued the restoration work started by the Scotts. They added a drawing-room, the long room and a west wing, which included the clock tower and the gateway. During the Troubles the Clare County Council met here, guarded by the East Clare Flying Column of the I.R.A., whose commanding officer, General Michael Brennan, used this historic building as his headquarters. In 1927 the Knappogue demesne was purchased by the Land Commission and the castle became the possession of the Quinn family. Mark Edwin Andrews of Houston, Texas, former Assistant Secretary of the United States Navy, bought it in 1966. With his wife Lavonne, a prominent architect in the U.S., and in co-operation with the Shannon Free Airport Development Company and Bord Failte Eireann, he carried out an extensive restoration before leasing part of the castle to the Irish Government as a cultural and tourist amenity. There was merely a nominal rent. The castle is now a medieval banquet venue and guided tours are arranged daily during the tourist season. BALLYKILTY MANOR may take its name from "Baile Ua Choiltedh", O'Kilty's home, but it may also be a derivation of "Baile Coilteach", the wooded home or the home in the woodlands. The original house on this site may have been the property of John MacNamara in 1614. An inscription on the kitchen mantlepiece dating from that year states that John and his wife, Honora Clancy, built the chimneys. Most of the present house dates from the eighteenth century and the rest from the nineteenth. The present front is a replacement of the original three-story front, which burned down in the nineteenth century. William Creagh occupied the property as a tenant of the Earl of Thomond in 1661. The manor was occupied by Thomas MacMahon in 1732. Francis Davoren was in possession in 1780. John Blood purchased the lease of Ballykilty in 1785. It remained in the Blood family until 1968, when it was purchased by Clareman John O’Gorman and operated as a hotel until the mid to late 1990s after which it was sold to a man from New York. ARDSOLUS supposedly took its name from a practice established by the friars of Quin Abbey in medieval times. Each evening before darkness fell, some friars travelled to this river ford and lit a beacon for the guidance of travellers. The place became known as "Ardsolus", the mound of light. James Frost, however, believed that the correct name of this ford was "Ath sollas" or "Ath Solas", the ford of light. Towards the end of the eighteenth century Ardsolus was a busy place. Fairs and Courts of law were held on a regular basis. The renowned Races of Ardsolus were run on the great Hill overlooking Quin village. Ardsolus was a "Toll Bridge" and close by was a Malthouse with a large stone outside with the inscription "entertainment for man and horse". This was the halfway stop for horse drawn transport from Galway to Limerick. DANGAN BREAC: This tower house can be viewed to the north-east of the Abbey. According to the Trinity College list John MacNamara owned it in 1584.